How to cycle indoor with Arcade Fitness video game? Fitness gaming and sport simulation is a new trend which helps you train indoor, making time fly. Arcade Fitness is a new cycling app very close to video game that can be used with your bike trainer. While you are cycling indoor, your character is riding in a virtual environment, for example track, castle or space. You have to make him jump over obstacles, make U-turns like in any platform video game. Enjoy your indoor workouts, racing with your friends online in realtime. In order to pair with a new device, go to the 'Settings Menu', 'Sensor Tab' and click on the 'Search Button'. Pick up your BLE or ANT+ device, save and... Cycle! Your cycling power will automatically be transformed into a virtual running speed and your character will go forward in the game. Arcade Fitness is now compatible with Bluetooth FTMS and ANT+ FE-C communication protocols. The resistance will automatically vary according to the slope of the road. If you are using the Windows version, you need to use a BLED112 USB stick to communicate with Arcade Fitness even if you computer has native Bluetooth Low Energy feature. For ANT+ communication, ANT+ USB stick is required too. Be sure to use a USB extension cable to put the stick close to the trainer (1-2m) and not behind a screen or antoher object. 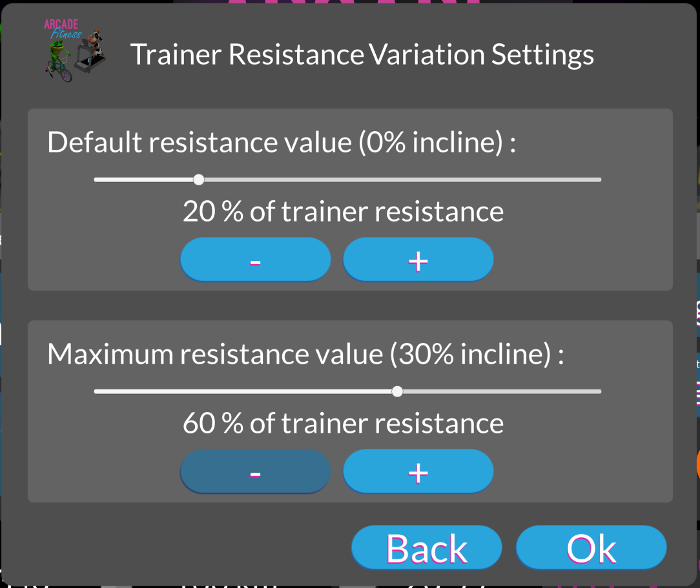 When you are in the 'Settings Menu' and you click on 'Save', you will get a popup asking you to setup the resistance variation parameters. This parameters are important if you want a good feeling while cycling. If the resistance tends to be too high with high slopes, you can lower the 'Max resistance value'. If the resistance is too low during the whole exercise, you can choose a higher value for the default resistance. If you want a constant resitance with no variation during the workout, select the same value for default and max resistance. The resistance will be constant: uphill as well as downhill. 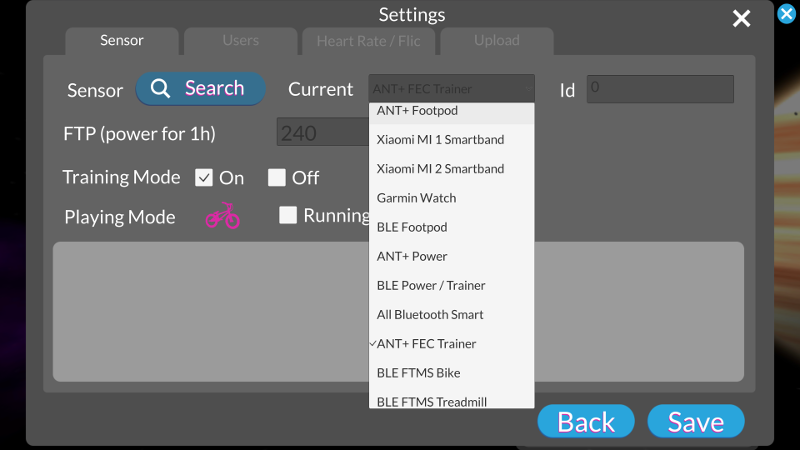 Now, you will be able to use any ANT+ FE-C trainer such as Bkool Smart Go / Pro or TACX or Eliter trainers. Arcade Fitness supports all BLE trainers computing power and all ANT+ FE-C bike trainers. Here are popular compatible home trainers, rollers and indoor bikes. Just put your bike on it and have fun!